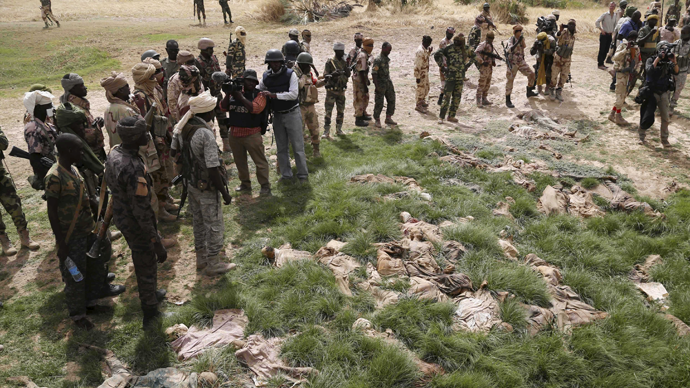 Up to 100 bodies have been found in a mass grave near the Nigerian town of Damasak, after troops from Chad and Nigeria liberated the locality from Boko Haram militants. The mass grave of dozens of bodies, some beheaded, was found by Niger and Chad soldiers under a concrete bridge on one of the main roads leading out of Damasak. Azem Bermandoa Agouna, a colonel of the Chadian army, told the AFT news agency that he had seen "about 100 bodies spread under a bridge just outside the town. There are heads here and bodies there, the mass grave has become like a termite mound. "Reuters says witnesses counted some 70 corpses. It’s suggested that the massacre happened some time ago as some of the bodies were severely decomposed, while others were partially mummified by the dry desert air. The colonel said the atrocity might have occurred two months ago and added: "This is the work of Boko Haram." The imam of the town was also found among the dead people. Witnesses say there could still be more bodies, as the smell of decomposition around the town is quite strong. The grave was found after Niger and Chad troops recaptured Damasak in an intensive ground and air offensive launched last Saturday. When Boko Haram gained control over Damasak in November, its militants killed about 50 residents and forced another 3,000 to leave the town, according to the UN's High Commissioner for Refugees. This year Chad, Niger and Cameroon have united to destroy Boko Haram, because Nigeria had failed for years to do this independently. The operation was called "Mai Dounama", after the name of a 13th-century emperor of Borno province in northern Nigeria. Some 36 localities, including major towns such as Bama and Dikwa, have been recaptured, with just three said to be still in rebel hands. The events are taking place ahead of presidential elections scheduled for March 28 in Nigeria, Africa’s most populated country and biggest economy. Incumbent President Goodluck Jonathan has been slammed for his government's failure to stop the violence. Over the last six years, Boko Haram has killed more than 13,000 people in their aim to establish an Islamic caliphate in northeast Nigeria. Their actions initially began as a campaign against Western education. The group has recently pledged allegiance to the Islamic State group in Syria and Iraq.